Borage Health Benefits, Dosage, Side effects and Warnings. Scientific Name: Borago officinalis L. Family: Boraginaceae. Borage, (Borago officinalis) is an annual herb that is found throughout the Asia Minor, the Mediterranean region, Europe, North Africa, and South America. Borage flowers and leaves are edible, commonly added to salads and used in cooking. Borage is also used as herbal medicine to dispel melancholy. Borage has been used for the relief of rheumatisms, colds, bronchitis, and to increase breast milk production. Borage plant grows to height of about 100 cm. The stems and the leaves of Borage plant are bristly or hairy. Borage leaves are alternate and simple, that grows to 10 cm long. 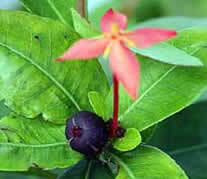 The blue flowers forms like a star with perfect narrow triangular pointed petals, hence it is also called starflower. 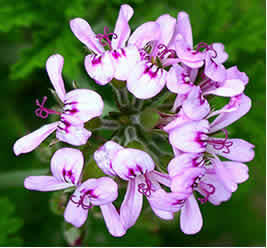 Although in some cultivated specie of Borage, pink and white flowers can be found. Borage are found in the wild but is also cultivated as ornamental plant. Borage is a popular culinary herb that contains minerals, vitamins and other nutrients that promotes good health. 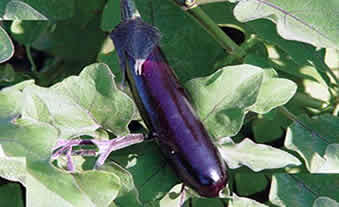 Borage is also being studied on its effect to breast cancer. Borage is rich in omega-6 fatty acid that is found to have positive effect against breast tumor growth. 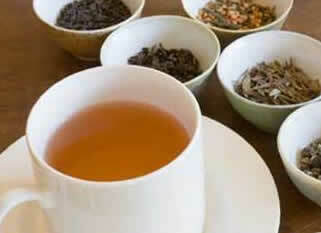 Borage tea is also used to promote milk production for lactating mothers..
Borage is also used to treat hangover. The chemical composition, botanical characteristic and biological activities of Borago officinalis: a review. Borage (Borago officinalis) is an annual herb which is cultivated for medicinal and culinary uses, although it is commercially cultivated for borage seed oil. Borage seed oil is the plant rich in the gamma-linolenic acid (26%-38%) which is used as dietary or food supplement. Other than seed oil it contains a lot of fatty acids such as linoleic acid (35%-38%), oleic acid (16%-20%), palmitic acid (10%-11%), stearic acid (3.5%-4.5%), eicosenoic acid (3.5%-5.5%) and erucic acid (1.5%-3.5%). 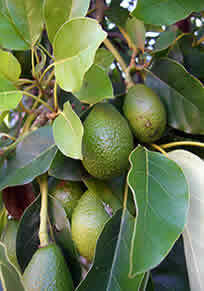 It is used for the treatment of various diseases such as multiple sclerosis, diabetes, heart diseases, arthritis and eczema. In this study different aspects of borage such as plant characteristics, production, applications in traditional medicine, clinical considerations, its effects on patients' blood and urine biochemistry, and also the effect of the its products on liver and kidney performance tests are presented using published articles in scientific sites. Source: Asian Pacific Journal of Tropical Medicine. 2014 Sep;7S1:S22-8. The protective effect of Borago Officinalis extract on amyloid β (25-35)-induced long term potentiation disruption in the dentate gyrus of male rats. Alzheimer's disease (AD) begins with impairment in synaptic functions before developing into later neurodegeneration and neural loss. In the present study we have examined the protective effects of Borago Officinalis (borage) extract on amyloid β (Aβ)--Induced long term potentiation (LTP) disruption in hippocampal dentate gyrus (DG). Wistar male rats received intrahippocampal (IHP) injection of the Aβ (25-35) and borage extract throughout gestation (100 mg/kg). LTP in perforant path- DG synapses was assessed using electrophysiology method and field excitatory post- synaptic potential (fEPSP) slope and population spike (PS) amplitude were measured by 400 Hz tetanization. Finally, the total thiol content of hippocampus was measured using colorimetric reaction based on the Ellman's method. The results showed that Aβ (25-35) significantly decreased fEPSP slope and SP amplitude comparing with the control and sham group, whereas borage extract administration increased these parameters compared to the Aβ group. Aβ induced a remarkable decrease in total thiol content of hippocampus and borage prevented the decrease of the hippocampal total sulfhydryl (SH) groups. This data suggest that Aβ (25-35) can effectively inhibit LTP in the granular cells of the DG in hippocampus, and borage supplementation reverse the synaptic plasticity in DG following Aβ treatment and that borage consumption may lead to an improvement of AD-induced cognitive dysfunction. Soure: Metabolic Brain Disease. 2015 Feb;30(1):151-6. Pharmacological basis for the use of Borago officinalis in gastrointestinal, respiratory and cardiovascular disorders. This study investigated the crude extract of Borago officinalis leaves (Bo.Cr) for its antispasmodic, bronchodilator, vasodilator and cardio-depressant activities to rationalize some of the traditional uses. Bo.Cr which was tested positive for flavonoids, coumarins, sterols and tannins produced a concentration-dependent relaxation of spontaneous and K+ (80mM)-induced contractions in isolated rabbit jejunum preparations, suggestive of Ca++ antagonist effect, which was confirmed when pretreatment of the tissue with Bo.Cr produced a rightward shift in the Ca++ concentration-response curves like that caused by verapamil. In rabbit tracheal preparations, Bo.Cr relaxed the carbachol (1microM) and K+-induced contractions. Verapamil also produced non-specific inhibitory effect. In rabbit aorta preparations, Bo.Cr exhibited vasodilator effect against phenylephrine and K+-induced contractions similar to verapamil. When tested in guinea-pig atria, Bo.Cr caused inhibition of both atrial force and rate of contractions. These results suggest that the spasmolytic effects of Bo.Cr are mediated possibly through Ca++ antagonist mechanism, which might explain the traditional use of Borago officinalis in hyperactive gastrointestinal, respiratory and cardiovascular disorders. Source: Journal of Ethnopharmacology. 2007 Dec 3;114(3):393-9. Cancer Prevention and Health Benefices of Traditionally Consumed Borago officinalis Plants. Nowadays, healthy eating is increasing the demand of functional foods by societies as sources of bioactive products with healthy qualities. For this reason, we tested the safety of the consumption of Borago officinalis L. and its main phenolic components as well as the possibility of its use as a nutraceutical plant to help in cancer prevention. The in vivo Drosophila Somatic Mutation and Recombination Test (SMART) and in vitro HL-60 human cell systems were performed, as well-recognized methods for testing genotoxicity/cytotoxicity of bioactive compounds and plant products. B. officinalis and the tested compounds possess antigenotoxic activity. Moreover, B. officinalis wild type cultivar exerts the most antigenotoxic values. Cytotoxic effect was probed for both cultivars with IC50 values of 0.49 and 0.28 mg · mL(-1) for wild type and cultivated plants respectively, as well as their constituent rosmarinic acid and the assayed phenolic mixture (IC50 = 0.07 and 0.04 mM respectively). B. officinalis exerts DNA protection and anticarcinogenic effects as do its component rosmarinic acid and the mixture of the main phenolics presented in the plant. In conclusion, the results showed that B. officinalis may represent a high value plant for pleiotropic uses and support its consumption as a nutraceutical plant. Source: Nutrients. 2016 Jan 18;8(1). Where can I get or buy Borage? Borage plant is cultivated and can be planted in your garden, seeds or young plant can be sourced through local horticulturist. 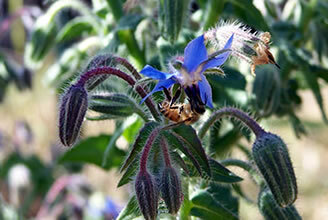 Borage is also commercially prepared as seed oil, soft gel, lotions, creams and as an ingredient in cosmetic products. Borage seed oil and soft gel supplements are available in most fitness and health stores. Borage is also available online via Amazon as listed: Borage / GLA Softgels for example, there are other brands, be sure to select one from a reputable manufacturer and do follow the suggested dosage. Borage tea can be prepared using 2 to 4 grams of dried Borage flower in a cup of boiling water. Taken 2 to 3 times a day. Borage oil and softgel as supplement. Taken as directed. Borage ointment, creams and lotions. Apply as directed from the labels.. Prepare about half teaspoon of dried Borage flower for every cup of water. 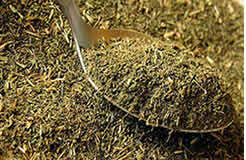 You can add other herbs or honey to improve the efficacy and taste (See cautions and side effects). Potentially unsafe. Borage plant parts such as flowers, leaves and seeds may contain pyrrolizidine alkaloids that can damage the liver and may be a cause of cancer if taken in excess amount and prolonged period. Possibly safe. Processed Borage seed oil that are certified to be pyrrolizidine alkaloid free are considered to be safe both for topical application and by ingestion. May cause allergic reaction. Borage because of its hairy or bristly leaves and stems may cause skin allergic reaction to sensitive people..
Children: Borage seed oil that are certified as pyrrolizidine alkaloid free can be used safely to children. Pregnancy and breast-feeding: There are no sufficient studies done to determine the safe use of Borage herbal medicine during pregnancy. Although Borage has been used to promote milk production for breast feeding mothers, it is still best to consult your pediatrician or a competent health practitioner before use. 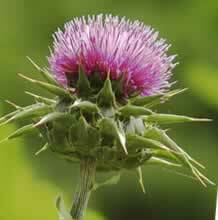 Liver disease: Borage products may contain pyrrolizidine alkaloids that can cause or worsen existing liver diseases.